Classy Kerry collected their second All-Ireland SFC title in three years, demolishing Mayo 4-15 to 3-05 as the westerners' All-Ireland final demons continued to haunt them at Croke Park. The notion that Mayo had played their 'final' three weeks ago against Dublin rang true as yet another September Sunday passed them by. None of their key forwards performed – not a single point from play from Conor Mortimer, Ciaran McDonald or Alan Dillon – and their half back line was given a comprehensive roasting. 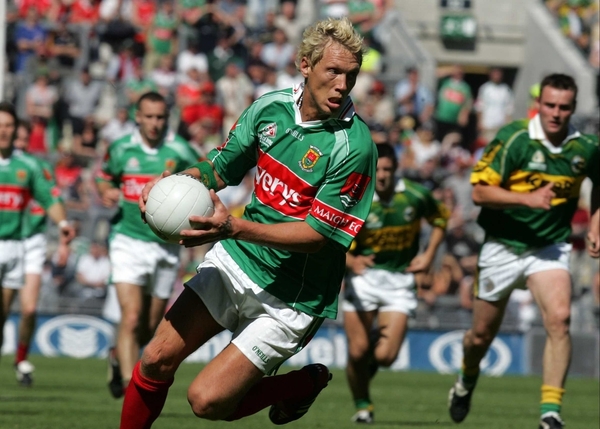 If Mayo supporters thought things could get any worse than 2004's capitulation against Kerry, they were wrong. Kerry had been saving up a performance like this for the whole summer, and perhaps foolhardily, Mickey Moran believed his troops could live with them. They matched them in the opening fixture of the National League back in February, but Kerry are a different animal in the championship and Mayo were never going to put the reins on them after falling 2-04 to no score behind, just 13 minutes into the fray. With Mayo's defence ripped asunder, early goals from team captain Declan O'Sullivan and Player of the Year contender Kieran Donaghy set the scene for Jack O'Connor's men. It was one-way traffic up until Kevin O'Neill, the 33-year-old former All-Star, found the Kerry net in the 16th-minute. Nonchalantly though, Kerry moved 12 points clear when Colm Cooper slotted home goal number three. With luck on their side, Mayo closed the gap to 3-08 to 3-02 at the break with midfielder Pat Harte and O'Neill both hitting the net in a minute of madness. Yet it was a false dawn for the Connacht champions, as they embarrassingly failed to score from play in the entire second half. Only three Mortimer frees saved them from entering the record books. The second half was an utter procession for Kerry, who were back to their rampaging best after their hiccup against Cork in the Munster championship. Substitute Eoin Brosnan's injury-time goal topped off their 34th All-Ireland triumph and a very neat league-and-championship double. Both Kerry and the Kilkenny hurlers succeeded in winning their respective leagues and championships this season, marking them out as the first sides to achieve such a feat since Tyrone and Kilkenny in 2003. Before the throw-in, one Mayo supporter proudly held a banner proclaiming 'The Hill Is Ours Now', with reference to his side's admirable attempt at warming up in front of Hill 16 last time out against Dublin. But for the gulf of today's 70 minutes, Kerry owned everything that mattered. They got quickly into their groove with Mike Frank Russell pointing off the post. Who knows what would have laid ahead for Mayo had Kerry keeper Diarmuid Murphy not blocked away O'Neill's fourth-minute shot, after Mortimer's quickly-taken free had sent the Na Fianna clubman into space. Russell made it two to the good when he sent over a free, won by Donaghy, and moments later, the Tralee giant played the final pass of a mesmerising move, hand-passing for O'Sullivan to slip home Kerry's first goal. The game was only eight minutes old when Donaghy's Midas touch at full-forward continued. The 23-year-old plucked a ball out of the sky, shrugged off Mayo skipper David Heaney and ripped a shot high to David Clarke's net. With veteran defender James Nallen injured, Mayo introduced David Brady and they stuck the burly Ballina man on Donaghy for the remaining hour, with some success. Heaney was re-positioned at centre back, and while he tried manfully to shore up the gaping holes in the Mayo rearguard, the angled running of O'Sullivan, Paul Galvin and even wing backs Aidan O'Mahony, who finished with 0-02, and Tomás Ó Sé tore the westerners to shreds. Points from Sean O'Sullivan and O'Mahony followed before O'Neill's first goal finally got Mayo on the scoreboard. Aidan Higgins sliced through the Kerry rearguard, hand-passing off for O'Neill, who showed great instinct to drop the ball onto his left foot and smash past Murphy from an acute angle. Kerry tightened their grip on the game over the next ten minutes, hitting 1-02 without reply. Galvin and Donaghy raised white flags, and then Cooper, having had his first effort parried onto the post by Clarke, sold Keith Higgins a dummy and slid his shot inside the near post for 3-06 to 1-00. Billy Joe Padden and McDonald, who was playing far too deep, sandwiched a score from Seamus Moynihan – only the Glenfesk clubman's fifth point in 61 championship outings – before Mayo had a great finish to the half. On 34 minutes, Harte plundered his first ever championship goal when he linked with O'Neill, and just seconds later, the latter had the ball in the Kerry net again, taking his tally to 2-00. A McDonald point attempt dropped down off the post and the lurking O'Neill gobbled it up to beat Murphy to his left. Bizarre, surreal, whatever you want to call it, those goals were flattering to Mayo and Kerry, to their credit, kept on never minding as they hit the next three points – including the opening two scores of the second half – to keep themselves ticking over. Some needle came into the game on 40 minutes when Cooper was sent crashing to the deck by Aidan Higgins' flailing elbow, and Donaghy leapt in to strike Brady in the stomach, but referee Brian Crowe was always in command. Kerry were content to let their football do the talking and it took all of 19 minutes for Mortimer to register his side's third point – from a close-in free. Mayo had nothing to combat Kerry's hard-running, total football style. Under-21s Barry Moran and Aidan Kilcoyne were thrown on but Moran, with his 6ft 5in frame, was never properly used as a target man. It went from bad to worse as a clearly at-odds McDonald kicked three wides in the space of six minutes. The confidence shown in the Dublin game was gone. In the closing quarter-hour, Cooper, O'Mahony, substitute Bryan Sheehan, Declan O'Sullivan and Donaghy all pointed as the final took on a disappointing 'target practice' feel. 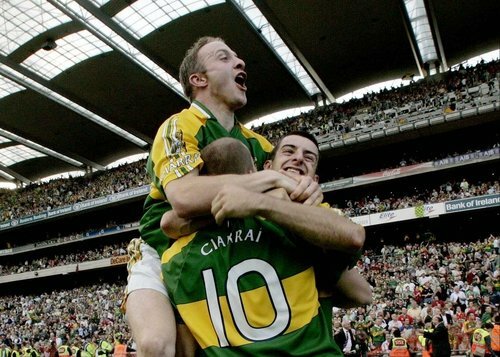 Brosnan's goal, which saw him chip Clarke after he had his initial attempt repelled, was the icing on the cake for Kerry whose manager Jack O’Connor described it as 'a dream day'. Kerry: D Murphy; M Ó Sé, M McCarthy, T O'Sullivan; T Ó Sé, S Moynihan (0-01), A O'Mahony (0-02); D Ó Sé, T Griffin; S O'Sullivan (0-01), Declan O'Sullivan (capt) (1-02), P Galvin (0-01); C Cooper (1-02), K Donaghy (1-02), MF Russell (0-02 (1f)). Subs used: E Brosnan (1-01) for T Ó Sé (half-time), Darren O’Sullivan for S O’Sullivan (52), B Sheehan (0-01 (1f)) for Russell (62), E Fitzmaurice for Griffin (67), B Guiney for O’Mahony (70). Yellow cards: T O’Sullivan (28 mins), Donaghy (44), Galvin (61), Fitzmaurice (68), Moynihan (70+3). Mayo: D Clarke; D Geraghty, D Heaney (capt), K Higgins; A Higgins, J Nallen, P Gardiner; R McGarrity, P Harte (1-00); BJ Padden (0-01), G Brady, A Dillon; K O’Neill (2-00), C Mortimer (0-03 (3f)), C McDonald (0-01 (1f)). Subs used: D Brady for Nallen (11 mins), B Moran for O’Neill, T Mortimer for Dillon (both 47), A Kilcoyne for Padden (52), A Moran for Gardiner (60). Yellow cards: D Brady (44 mins), T Mortimer (50), A Higgins (62), Kilcoyne (68).